Greenpeace Co-Founder and ecologist Dr. Patrick Moore, slammed a new study claiming a dramatic and irreversible mass species extinction. “This [journal Nature] article should never have made it through the peer-review process,” Moore told Climate Depot in an exclusive interview. “The fact that the study did make it through peer-review indicates that the peer review process has become corrupted,” Moore, the author of the new book “Confessions of a Greenpeace Dropout,” added. “The authors [of the journal Nature study] greatly underestimate the rate new species can evolve, especially when existing species are under stress. The Polar Bear evolved during the glaciation previous to the last one, just 150,000 years ago,” Moore explained. But Moore, in an interview with Climate Depot, refuted the claims of the species study. “The biggest extinction events in the human era occurred 60,000 years ago when humans arrived in Australia, 10-15,000 years ago when humans arrived in the New World, 800 years ago when humans found New Zealand, and 250 years ago when Europeans brought exotic species to the Pacific Islands such as Hawaii,” Moore explained. “Since species extinction became a broad social concern, coinciding with the extinction of the passenger pigeon, we have done a pretty good job of preventing species extinctions,” Moore explained. This is not the first time Moore has gone to battle over alarming claims of species extinction. In the 2000 documentary “Amazon Rainforest: Clear-Cutting The Myths”, Moore bluntly mocked species extinction claims made by biologist Edward O. Wilson from Harvard University. Wilson estimated that up to 50,000 species go extinct every year based on computer models of the number of potential but as yet undiscovered species in the world. Environmental activist Tim Keating of Rainforest Relief was asked in the 2000 documentary if he could name any of the alleged 50,000 species that have gone extinct and he was unable. “No, we can’t [name them], because we don’t know what those species are. But most of the species that we’re talking about in those estimates are things like insects and even microorganisms, like bacteria,” Keating explained. UK scientist Professor Philip Stott, emeritus professor of Biogeography at the University of London, dismissed current species claims in the 2000 Amazon rainforest documentary. “The earth has gone through many periods of major extinctions, some much bigger in size than even being contemplated today,” Stott, the author of a book on tropical rainforests, said in the 2000 documentary. “Change is necessary to keep up with change in nature itself. In other words, change is the essence. And the idea that we can keep all species that now exist would be anti-evolutionary, anti-nature and anti the very nature of the earth in which we live,” Stott said. Bye Bye Global Warming Movement — Welcome to the Next Eco-Scare — Species?! Flashback Jan. 2010: Time for next eco-scare already?! 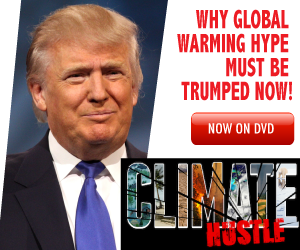 As Global Warming Movement Collapses, Activists Already ‘Test-Marketing’ the Next Eco-Fear! Flashback: U.S. Senate Report Debunks Polar Bear Extinction Fears — Canadian Inuit declare polar bears not at climate risk: ‘Polar bear population is very very healthy’ For more on Polar Bears go here. UN trying to promote diminishing biodiversity as the NEXT BIG CRISIS – 2010: Excerpt: ‘It is hard to make definitive statements regarding loss of diversity when science can not even tell us how many different creatures there are on the planet. Nevertheless, the UN has launched the International Year of Biodiversity, warning that the ongoing loss of species around the world is affecting human well-being…The words of Henry Louis Mencken we quoted in The Resilient Earth put it best: “The fundamental aim of practical politics is to keep the populace alarmed, and hence clamoring to be led to safety, by menacing it with an endless series of hobgoblins, all of them imaginary.” This is a tactic that the UN has turned into an art form. Having succeeded with turning global warming into a “crisis” they are now giving biodiversity a go. Lack of proper science, contradictory claims by activists and experts, conflicts with the needs of average people just trying to live their lives—yes, this sounds like a UN generated, politically motivated “crisis.” After all, the bureaucrats and parasites at the UN rode the global warming gravy train for more than a quarter century. Now, with the panic over global warming all but vanished, they have started pushing a new biodiversity crisis. ‘We Are Destroying Life on Earth,’ UN Conference Claims: ‘Scientists over the past decade have identified new species at an unprecedented rate. The 2008 World Wildlife Fund (WWF) study First Contact in the Greater Mekong reported that 1,068 species were discovered or newly identified by science between 1997 and 2007 — averaging two new species a week. And the Census of Marine Life — an ambitious, 10-year project to catalog the diversity of the world’s oceans — recently concluded, having identified more than 6,000 potentially new ocean-going species.